There are certain things in life that give immense pleasure, satisfaction and joy to you and those around you as well. Baking is one such activity. It is one of my favourite pastimes, something that I can never tire of or get bored with. I love the look of surprise and delight in people’s eyes when they hear the words “home made “. Going down memory lane, after having completed my 10 standard, my mother got me enrolled in an eggless cake making class. I met up some old friends there and we ended up having a good chat without paying much attention to the class. But the notes and memories remained and years down the line, making cakes is my most favoured baking indulgence. I have made, tested and developed many cakes and cake recipes, some of them failing me at times, but most of them always a success. Taste, texture and presentation are vital to good cakes. The texture of the cake poses to be a challenge, when one is into eggless baking. Over a period of time I have found suitable substitutes to eggs that do not compromise the taste and texture of the cake. A few basic cakes, particularly sponge cake recipes, can be a treasure to possess since you can play around with the presentation by embellishing and beautifying them in a number of ways, with cream, butter, fruits, nuts, dry fruits and chocolates, each time presenting them in different ways that are always a delight to the human sensory faculties. This cake is quite simple to make. It can be dressed in a number of ways over the chocolate covering, with fresh seasonal fruits, flaked almonds, chopped pistachios, etc. Mangoes, berries and peaches combine well with chocolate. Grease and line the bottom of a 9” round cake tin with greaseproof paper/baking parchment/butter paper. In a mixing bowl, assemble the flour, cocoa powder, baking powder and baking soda, mix with a spoon and sieve once to make the mixture uniform. Preheat the oven at about 100 to 120 degrees centigrade. Add in the condensed milk, melted butter, vanilla essence and water. Beat with an electric hand mixer, whisk or spoon just until the mixture is uniform and smooth and there are no lumps. This shouldn’t take more than a minute with an electric hand mixer/beater. Be careful not to over beat as this tends to stiffen the batter which might result into a harder textured cake. Pour the batter into the cake tin and bake for an hour at 150 degree centigrade. 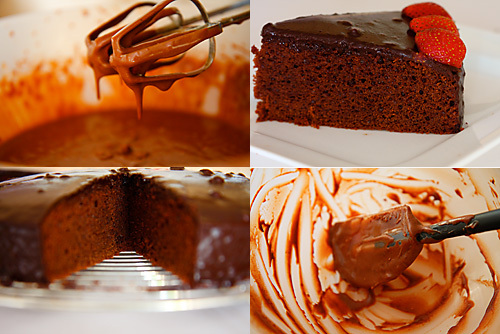 For the icing, break the chocolate into chunks and melt it slowly in a bowl over a pan of hot water (a double boiler). Mix in the butter and stir until the icing has the consistency of thick pouring cream. Place the cake on a cooling rack and over the icing, smoothening the top and sides with a palette knife. Allow to set and decorate as desired or savour it as it is. P.S. Since this is an eggless cake, you might find the batter on the looser side, but it comes out alright, soft and spongy out of the oven. I have topped the cake pictures above with freshly cut mangoes, when they were in season. Anu, I just love the way the three strawberries are so precariously poised on the edge of the chocolate cake. My 23rd birthday was memorable for more reasons than one. You got me to call my friends to your place and treated 10 of us to that splendid Chinese lunch u made. But the one that strikes me the most and the one that they remember the most is the out-of-this-world strawberry cake u baked! I cant wait to try this one out. But am afraid i'll short of patience! Mihir, are u listening? Rustoo: I think Mumbai is the only place where eggless cakes/products are easily available off the shelves in India. There are people all over, maybe the percentage is minute in the western countries who prefer eggless stuff either out of choice, allergies, religious or other concerns. Simi: This is not one of those elaborate cakes of mine. I'm sure it wont take much of your patience. Hi Anu, I had set google alert for eggless cakes and through that found your site just now. The cake looks very good and love the presentation and pictures as well. I have baked an eggless chocolate cake before using silken tofu. I've not tried it with condensed milk. Will try that too sometime soon. This looks divine, specially the fruit combination. I think chocolate makes a great pair with fruits. Hey – a question. Are you still in Mumbai? I have a list of all Mumbai bloggers up on my site and wanted to add you. Anushruti, Thanks for visiting Holy Cow! What a lovely site you have, and I am so glad to have found it. The cake looks perfect. Hope to see many more wonderful recipes from you. lovely pictures anu!!! The cake looks fabulous!! Madhuram: Eggless cakes with condensed milk turn out very well. I use it whenever I need a deep flavour, taste and good texture. Condensed milk does a great job for eggless sponge cakes. Simran: Yes, fruits and chocolate pair well especially certain fruits like mangoes, berries and peaches. Usha: Let me know how you like the cake. I've never had chocolate sponge cake but it looks great! I love your photos. I've been waiting for this recipe for so long now but looks like i've visited last 🙁 ……. 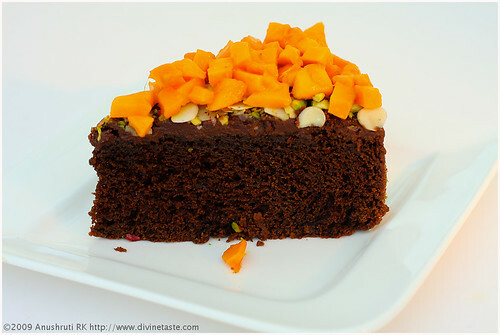 can't wait to try this out though 🙂 'Chocolate cake with mango topping' i would never have guessed that combination… looks so very inviting….. hey Anu i've noticed in other eggless cake recipes they use soda water instead of water to make it fluffy, not sure if its a good idea…. wanted to check with you…what do you think? Preethi: I did try using soda water for cakes initially when I got into baking, but have used it only once. I prefer not to use it as the fluffiness can be got with alternative ingredients. Mangoes and chocolate cake!! very unique!!!! both are my favourites..and amazing pics..will try this out.. I bake chocolate cake with orange flavour (liqueor, rind, fresh orange juice and orange flavoured chocolates).. let me know if you have any other recipes of chocolate cakes with a unique fruit combination. Have tried plums, pineapple, strawberries and orange with chocolate cakes. Soumya I still remember the wonderful cake you had baked when I think we were in high school. Those were the days when I had still not gone eggless. 😉 Chocolate and orange make a delightful combination! Very proffessional photos and cake looks yummy. I appreciate your efforts and time for a such good work. I am sure many will switch over to eggless cakes and more people will ask for eggless cakes in cake shops. I shall try to bake this cake and offer it to my guests and before all that offerings to Lord Krishna ! dattu mama joins me in applauding your work ! Anu, i'm going to try this today, but just realised that the recipe doesn't mention sugar, will the sugar in the condensed milk do? waiting for your reply to start on it….. Yes Preethi…there is no need to add additional sugar, if you are using sweetened condensed milk for this recipe, besides there is also a certain amount of sugar in the cooking chocolate for the icing if you plan to ice your cake with the above icing. I finally made the cake last weekend… it was yummy. Tanya loved it and her friends in her school too 🙂 All those kids who were allergic to egg, devoured the home-made chocolate cake 🙂 But more questions though, the vanilla flavor was stronger than the cocoa flavor?? Why was that? i used the exact measurements. Preethi: I'm so happy Tanya enjoyed the cake. As far as the vanilla flavour overpowering that of cocoa goes, it depends on the quality of vanilla and cocoa powder. I use natural vanilla essence and have not experienced this so far. What vanilla essence did you use? i am plannin 2 make a cake fr my daughter's 2nd b'day!! have never made a cake at sucha large scale. could u pls let me knw how gud is pouring sugar syrup on the cake?? does it soften the cake… also wich wud b a better option, condense milk cake or silken tofu cake?? Adding sugar syrup to cakes is good for decorative and festive cakes, especially when there is elaborate icing on the cake. It does not necessarily make the cake softer, what it does is wets the cake. The texture is totally different from cakes to which sugar syrup is not added. Also, it is best served and eaten with a spoon. In my opinion, for a children's birthday party its best that you dont wet the cake with the sugar syrup. Unless you plan to bake separate cakes for children and adults. I personally feel that condensed milk cakes are great for parties. They are rich, taste great and have a wonderful aroma and texture. It is ofcourse a personal choice. You can bake eggless cakes with condensed milk, like the recipe given here based on the number of people and your serving size and ice them with cream, butter or glace icing. Have a great birthday party and wishes to your 2 year old. I made this chocolate cake. And it came out brilliantly well. I've seen u bake cakes, and have eaten them, so i can tell. But i did a very stupid thing! I've been using the same recipe for chocolate cake since forever and it always works well. Only mine has a dome at times or develops cracks. What do you do to get them so perfectly ready to be frosted?!? Congratulations. U have a wonderful blog. I'm glad you like divinetaste. Getting a dome shaped cake or a cracked surface is almost always due to over heating or uneven heating. Do you place your cake in the centre of the oven and bake for an hour at 150 degree centigrade? Make sure your cake is not near the hot sides of your oven. Hey!Amazing amazing pics. I am a certified chocoholic so I love ur cake. Do check my event and win a chance to take away gift! Thanks anu, for the input. Could be because my oven is pretty small. Btw, which brand of vanilla extract do you use? Nilambara: I use a natural alcohol free vanilla extract which I source from the US. Planning to make my own version of vanilla extract sans alcohol soon. Will post the recipe, if the attempt is successful. wonderful website! wonderful recipes ! wonderful presentation! Pls help me make a EGGLESS & SUGAR-FREE Brownie or Chocolate Fudge. Keep up the good work, Warm Regards. Sheetal. Deepika: You can use plain flour (maida) along with the other ingredients for this recipe. You should be able to get a soft and fluffy cake with the above recipe. I never use soda water to make cakes and have never felt the need either. Can I try to bake this cake in a Micro wave oven..? Hello Bharat: You could try making it in a microwave oven but I'm sorry I wont be able to give you any inputs on baking in a microwave. Unfortunately or fotunately I belong to the category of microwave despisers. I came across your website very recently. My cooking also belongs to the category of eggless n meatless.. I tried your vanilla cake+choc frosting recipe as a Chrismas cake and too glad to let you know that it came out well.It was my first cake using condensed milk. I would definitely give a try to all the yummy fare you have posted here. Hey Anu, thanks for the recipe. Have made this cake twice now and love the taste. The only problem is, it seems to sink in the middle while its in the oven. Can you please give me some suggestions on how to avoid this? Also, please confirm 400gm of condensed milk is same as 400ml. Krupa: Your cake sinking in the middle could be because of uneven heating in the oven. Are you placing your cake tin right in the centre of your oven? Also make sure that you don't open the oven door after you place the cake in the oven. This would introduce air inside the oven and disturb the temperature inside the oven and interfere with the cake batter rising to a well baked cake. One entire tin of condensed milk weighs 400 gm. Hope this helps. I think my search for perfect eggless cake have ended here. In the family with veg/non-veg cooking preferences, it becomes practically imposible to please everyone with good cakes without eggs. THanks a lot for posting such beautiful recipe. I tried your eggless chocolate cake recipe today and it came out very well. I have tried a few recipes using soda water before but this is the best .can u give me any tips to make the cake rise well. (I filled my pan a little below the 1/2 way mark).I used good quality cocoa but felt my cake dint have rich chocolate taste and it had some maida taste. pls suggest the changes I have to make to get these results. Thanks a lot for this beautiful eggless cake. This recipe gives a lovely eggless chocolate cake and personally I'm not a fan of adding soda water to eggless cakes. Using the correct pan and filling it a little more than half way mark and generally following the recipe to the tee should give great results. Using good quality ingredients that include cocoa (which you said you have) and vanilla are essential. If the batter is mixed properly, baked at the correct temperature for the specified time you should be able to avoid the flour (maida) taste. You could also try to increase your vanilla to get a more pronounced flavour. do you still stay in mumbai? can u please give me the brand name of 'good cocoa'? char: Waitrose or Hintz available in Hypercity are good brands. If not Weikfield is also not bad. will adding orange zest and orange juice be ok to this cake composition? are they compatible? Char: As I have said above Waitrose or Hintz available in Hypercity are good brands. If not Weikfield (available in most stores) is also not a bad idea. Chocolate and Orange pair well. But I havent tried it for this recipe. You could add the orange zest but adding orange juice will require other changes in the recipe. Until I test it I'm unable to give you inputs on this. If you do try it, then let me know about it. I have been trying a few eggless receipes, but the cake keeps turning out rubbery and tastes more like flour!! Also the top of the cake becomes very hard!! So I just came across your website. I hope to try this receipe now. Question: The receipe asks for 200 gm plain flour, is that just all purpose flour?? Or any particular kind? Meera:Good luck with your baking. Hope your cake comes out well this time. Yes all purpose flour is Maida. I tried this receipe using cup…cupcakes..its was really awesome..thanks for the lovely receipe..
why my eggless choclate cake sinks in the middle of baking in microwave cooking? chhavi: I never use a microwave oven for cooking or baking, so I'm sorry I can't guide you on this. I tried the receipe and the cake came out great! However it didn't taste very chocolatey…maybe it's the brand i used. There is no harm in adding extra cocoa right?? i wanted to try this cake but confused with the measurments? Can u pls tell me measurments in cups instead of grams? Meera: If you add extra cocoa you will have to make other changes too or else there would be change in texture as well. Meeta: I have updated the recipe and put up the cup measurements. However, for accuracy and consistency in baking it is best to measure in metrics as measuring in cups does not give exact measurements. I retried this receipe again last night, and for some reason it was very dry and crumbly…your thoughts?? Meera: I have no idea what exactly you did so its difficult for me to say anything. This recipe has never failed me. If the ingredients are measured correctly, the baking time and temperature is also correct then I see no reason why this shouldn't work. Unlike other means of cooking, in baking precision is the key. However, if you tell me what changes you made then I might be able to help, considering you had better results the first time you made it. Thanks for the lovely recipe. I just love your website. Its a real delight for people like us who are venturing into egg less baking. I have some questions, it would be great if you can guide me on them. 1> I have tried this recipe more than once. The taste is great but its a bit crumbly. My measurements were correct since I have got this result more than once. Is it normal? 2> I had used whipped cream for icing for one of the trials. I used sugar syrup to wet the cake for this trial, since I was going to refrigerate it. But it became a bit hard when I refrigerated it. Is this normal? Or can we achieve the softness even after refrigerating it? like the ones in those black forest cake types. First of all a big "CONGRATULATIONS" on the amazing food blog you have. I've always been very fond of cooking n baking specially and love trying new recipies from different blog. Coming back to your chocolate cake, it looks amazing and I'm definitly going to try the eggless version soon. However I just wanted to check with you if we can use "Olive Oil" instead of butter in this cake. I must say that you have a fabulous website. I am a newbie in the kitchen and your website is very motivating. For the past 2 months I have been trying my hand in baking. Your recipe gave me THE BEST cake! Hello again, I tried making this but it didn't turn out so well… as you know ive had previous success with your recipes, so i thought it worthwhile asking you for guidance! I used a good quality cocoa powder but the end result was not sweet at all. Just wondering if the powder you use is sweetened? Suchithra: That is so wonderful! Great that you have made a foray into baking as it is one of the best ways to make loved ones happy! All the very best for your future baking expeditions! Ladybird: Oh dear! Wonder what went wrong here for you since I have made this a number of times with great results. I don't use sweetened cocoa. What I suggest is use 4 tbsp of castor sugar with the condensed milk and make sure you don't use excess flour or cocoa other than that stated in the recipe. The cake might be less sweet for some and adding the sugar will help to get the right amount of sweetness. Hope this helps. Let me know if I can be of more help to you. All the best! Thanks for the divine recipes. I'm allergic to eggs and have tried various eggless recipes that just weren't delicious. Just one question regarding this recipe … do i add the chocolate icing to the cake immediately after removing it from the oven or shoul i allow it to cool first and for how long? Tumi: I'm so glad that divinetaste helps you to bake….wonderful! Allow the cake to cool completely before you ice it or else the icing would melt away from the heat & warmth of the cake. Good luck! Thanks so much for this recipe. My husband really liked this as this is a more crumbly cake than the one that I have baked before. I have tried baking with other eggless choc cake recipe which I think was too moist and my husband was not a fan of it. We really had a great time and enjoying the cake with our children yesterday as it was my husband's birthday. Shirlynn: Thank you for your feedback and for sharing your precious moments here. Happy birthday to your husband. Would like to know if we could replace all purpose flour by whole wheat flour/mixed flour(barley, wheat, soya etc) which is healthier. Also, as someone suggested olive oil in place of butter. If not, could you suggest me a chocolate cake recipe with these two options so that we end up with a healthier version of the cake. Wow, this is a fabulous cake that has again turned out beautifully! I just saw someone asked about adding orange to it. Although its perfect as it is I did add some orange flavor to it today by adding a tiny bit of pure orange extract, only an 1/8th of a teaspoon so that its very subtle. Thanks for sharing your recipes and your stories. Neera: You could experiment with the flours you have in mind and the oil with the butter. The cake texture will be a little dense and heavy in comparison to this soft and light cake. I have cake recipes with olive oil and whole wheat flour. You can look for them in the recipe index under quick links or under eggless baking! Good luck! Rick: Chocolate and orange are a great combination! Glad you like this cake recipe! Thanks for writing! its really ausome…thnx 4 d gr8 recepie…!! Do u cook with a gas oven or electric oven? Sheila: Electric oven…I find that gas ovens have unequal distribution of heat. Hi, I made my first eggless cake with this recipe and it came out brilliant. Thanks for a nice recipe. First time used condensed milk in cakes and loved the deep flavour and moist texture. I made it chocolate orange cake by reducing water to 120 ml and adding 30 ml fresh orange juice. Also added some orange zest and replaced vanilla to orange essence to get a mild orange flavour. Since I made it as a loaf, I guess the difference in pan size resulted in crack at top.So wanted to ask if this cake can be frosted well? Since I felt it was little on the softer side to hold up much as a layered cake for parties…your opinion? Thanks a lot for the wonderful recipe. I tried and it came out very nice. I have been trying to learn to make a good eggless cake for the past 2 yrs but could not your website is awesome. I followed your instructions to the T and the cake did turn out great, except for the fact that when i left it out in open to cool off (before applying the icing) it became a little too hard and dry on the outer edges. What do you think could be the reason? Sailaja: Glad you had success with this recipe! MissMke: At times, certain ovens behave differently so you need to judge them and act accordingly. Try baking it for 5 min lesser the next time, if the skewer comes out clean then you are done and you wont have the dryness. Mouth watering photographs as always n more the delicious recipes……. My Husband is a big time chocolate cake fan so he had a treat relishing this one as welll as was a treat seee him relish it…..
Thnks fr sharing this yummmmmy recipes…..
well my name begins with an Anu too :-). I came across ur site while browsing for eggless cakes. I want to try this cake as I am mersmerised by its looks!!! However I have a couple of questions. 1) You say to bake it at 150C for 1 hour i.e about 300 F . Usually the lowest I have ever baked is 325 F so am just wondering if that it is indeed so and not a typo? and 2) 150 gm butter :can you tell me approx in cups ? I really need a quick response as I need to bake in the next couple of days. So I would really appreciate if u would respond soon . Thanks in advance. Also I have noticed that eggless cakes though moist tend to crumble easily , is that the case with this cake too? Anu: This cake and many of my other cakes are baked at this temperature. 150 gm is 3/4 cup butter. Cn u suggest me wht cn i use instead of unsalted butter?? I wnt to bake cake for my best friend..
priyanka: You can use salted butter like amul, brittania, govardhan, etc. That's what I do for my cakes too as I currently dont make fresh butter like I used to due to lack of time and good unsalted butter is hard to come by. Janani: I'm sorry at this point, I'm not aware of any substitute for condensed milk. hi Anu, this cake really was superb! i think it finished within minutes! i am not sure why but my cake was very soft and crumbly…could i have made mistakes in any one of the steps? really appreciate your reply. i forgot to mention that i added some chopped cooking chocolate, could that have any effect on the texture? never mind. thank you. appreciate your reply. happy women's day. keep going!! Hi Anushruti ,I baked this cake for my mom n dad's anniversary…..i must tell u that it came out awesomely delicious and yummy.Thanks a lot for this recipe and keep up the good work!!!! Hi Anu,iv baked this cake once with lovely results.Wish to make it again today. Wanted to know if i can increase the quantity of Cocoa powder(by a couple of tablespoons)in this recipie for a more intense chocolate flavour..?..as my husband is a dark chocolate fan.If yes,wats the maximum extra cocoa powder i can add to acheive good results.Does it require any other changes to d recipie.pls specify. Uma: You have to be very precise in baking to get accurate results. Please follow the exact recipe for accurate results. Tejal: How nice to know that! I remember baking for my parents anniversary too…years ago when I used to live with them and it made me so happy! Meenal: Generally, the rule is when you increase the cocoa powder, decrease the flour by the same amount. But this recipe already has too much cocoa powder in it. I would suggest not to alter it, but if you are sure you want more cocoa in it…don't increase it more than 25 gm. For a dark chocolate cake, you might want to take a look at this recipe too. Melanie: How nice to hear from you! Thank you for the feedback and I'm so glad you and your friends enjoyed this. After the sweet taste of successful chocolate brownies, I had a hard time controlling myself from venturing into the kitchen again. 🙂 Made this cake today (Using all ingredients in half, being overtly cautious and treading slowly)SO So happy to tell you that it has turned out so well. Please ignore the spelling mistakes. One small question : I used Bournville for the topping alongwith homemade butter. I had a really hard time melting and mixing it . What cooking chocolate must be used? Kindly tell me the brand :)By the way I really love your pics. tomorrow is one of my v.close friend's b'day and i plan to bake this cake for her as i have previously tried it n it came out wonderful..
just wanted to check tht after icing u allow to set the cake in the fridge?? coz earlier i have done this n the choclate icing became hard..although the sponge was good?????? can u plz clear my confusion..
Kanchan: you should use cooking chocolate. High end brands like Barry Callebaut or Morde which is available in shops selling wholesale bakery products. love to cook: Just leave the cake out and bring it to room temperature, about 30 minutes for the icing to be right. Covering up the cake (done carefully) will also help! thanks a lot for ur quick reply..
How much (in cups/Tbs) is 150 ml water? saumya: 150 ml is 1/2 cup + 2 tbsp (125 ml + 30 ml). I have baked this cake several times, and it has always been well appreciated. Thank you for the recipe. hey, you have added 2tsp baking powder and 1tsp baking soda. Isn't it too much? because wherever i have seen such recipies they hava added like 1tsp baking powder and 1/2 tsp baking soda. and can we use salted butter like amul buter for the cake?? or can we use vegetable oil?? if not why?? sonika: Well…this recipe works for me and each recipe has a different structure and these are the quantities for this recipe. You can use salted butter that is amul butter. You could also use oil..will give a different texture and flavour.Its a personal choice. Thank You so much for sharing all your cake recipes. I just follow your steps and get them perfect. But, the only problem I face is that, Whenever I bake a cake it swells excessively in the middle and consequently gets torn out too much which gives it a poor look and makes frosting difficult. plain flour means wheat aata? I love baking I am going to try this recipe , just had few questions to clarify. Hi, great site, great recipes, love it. A query: at the beginning you have mentioned to preheat the oven at 100-120 degree centigrade, however, towards the end you say to bake at 150degree centigrade for an hour. ? Do we increase the temp. at the time of putting the cake tin into the oven?? Sandy: Are you using the right sized tin? When you pour the cake batter into the tin make sure that you don't fill it up more than 3/4th the tin. Sushila: Sorry for the late response. You can use lightly salted amul butter and yes you could use cadbury cocoa powder. Preeti: Yes. You could also pre heat it at 150C directly. Sneha: So happy to hear about your success! hey, the pictures look amazing! i'm planning to bake this cake but i've a few doubts. 1. 150gm butter melted so it has be in a complete liquid state or it just has to be soft? nishita: Melted butter, liquid in texture. Yes, it will affect the overall texture if you try and alter the recipe. I baked the chocolate cake and it was amazing. Thanks a lot. Hi Anushruti.. a quick doubt, when you say 150gms of Melted butter, 150 gms is measured after the butter is melted or solid butter of 150gms should be melted? And also can you please tell me how much does this melted butter measure in terms of cups. Neelu: The weight would remain the same, before and after melting. Measure the butter before melting for accuracy and to prevent wastage. nishita: 7" would be too small for this amount of batter. You will have to halve the batter or bake it twice or in 2 7" tins. Happy birthday to your brother. i just made it! i bought a 9" tin! the cake loooks so perfect! he's going to love it! i just have to do the icing now!! thanks for this awesome recipe! i love your site.. 😀 and thanks for wish! I made this yesterday for my daughters birthday and my baking skills are nothing gr8… But it came out well ! The middle did dip a bit but the cake was really yum n we all loved it ! Thanks ! Sumi: Thank you for writing here. Happy that your family enjoyed. Hi Anushruti, this cake looks delicious and I would love to bake it for my nephew's upcoming birthday. Do you know if the recipe doubles well or should I stick to two 9" inch cakes? Also, if I wanted to get a bit more height, could I use an 8" pan? Thanks so much! Dipika: The recipe can double treble or quadruple even. Yes you could use an 8" pan but the pan has to be deep and not the regular sized one. I was initially skeptical about baking a cake at such low temperature, but was delighted to see that the crumb and rise of the cake was very very good. A small feedback though, the amount of cocoa mentioned in grams is overpowering and definitely does not translate to 1/4 cup. Would cut back the cocoa to around 20- 25 grams the next time, and maybe add some sugar.. But definitely there will be a next time. Nivedita- The amount of chocolate in a recipe is quite subjective and depends on personal preference. This amount works for me and for many others. Feel free to tone down the cocoa powder. 1/4 cup (60 ml) is 50 gm. Hi..I tried the cake as per ur receipe. But once I took it out of the oven the cake just sank. Also it was a bit gooey. What could have gone wrong? vidya: Please refer to my baking FAQ section. The cake looks great .. thank you for sharing the recipe.. it would be of great help if u shared eggless cakes of different flavours like black currant, blueberry, butterscotch, chocolate truffle, red velvet, choco lava .. etc thank you in advance..
Pooja:Sure! I already have a selection of cakes that you can choose from. Please look for them in my cakes and cookies section. Anu, your recepies are awesome. Just wanted to know whether I can substitute oil in place of butter while baking a cake. Maya: Thank you. Yes you can replace oil with butter. It's an excellent recipe! Tried it and loved it. Hi, I bake this cake few times, and it was hit with the family. Thank you! Sure will keep this in mind. Hi Anushruti ..tried this cake n it's very tasty..thank u for a lovely recipe.. However this cake sank in the centre after i removed it from the oven..can u pls tell me after baking do we immediately transfer the cake on a cooling rack or wait a few minutes ?i waited for 15mins..how to avoid it from sinking ? Coz as per the instructions I used the right size tin n followed the recipe spot on ..but on the brighter side it was delicious n disappeared soon !! Pooja- Please refer to my baking FAQ for reasons as to why your cake sunk. If you used the right size tin and measured the ingredients, the only reason I can see is uneven heating in the oven. gayathri-You mean the weight of the cake? I havent weighed it after it was baked, but this should serve 8 to 10 people. Hi, just browsing this recipe. wanted to try it. can you please tell the replacement of condensed milk with sugar and how much quantity..
Sur_ This recipe uses condensed milk for the texture and the body of the cake. Please look for cake recipes under http://www.divinetaste.com/category/recipes/cakes/ for recipes without condensed milk. You need an oven if you want to bake cakes nicely. I dont recommend baking in a microwave.